Dividend - What Does It Mean? What is a dividend? 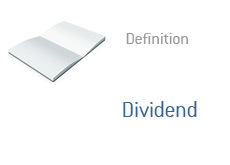 What is the definition of a dividend? Why do some companies pay out dividends, while other companies do not? A dividend is some form of a taxable benefit that is paid out to the shareholder of a company. Many companies pay out their dividends on a regular basis (usually quarterly). Why would a company pay out a dividend? A company that pays out a dividend is usually a long-established company that generates profits on a very consistent basis. Dividends are paid out in order to encourage shareholders to continue holding shares in the company, as well as building sustained, long-term shareholder value. Dividends are paid out of current or retained earnings. Companies are not required to pay out dividends - many companies do not. Companies are also not required to continue paying out dividends if they have done so in the past, but cutting or eliminating a dividend is usually a sign of poor health for a company.